Back again, following last nights excellent contribution from a reader with their email to David Cameron and Treasury Minister Sajid Javid, to the theme of responses from MPs and government ministers on so-called benefit ‘reforms’. Another reader wrote to her MP David Rutley, member for Macclesfield, asking the same questions about the government’s flagrant abuse of statistics to mislead the public. To his credit, Rutley did act on her request to take the matter up with the government. He wrote to the Minister for Welfare Reform, Lord Freud. 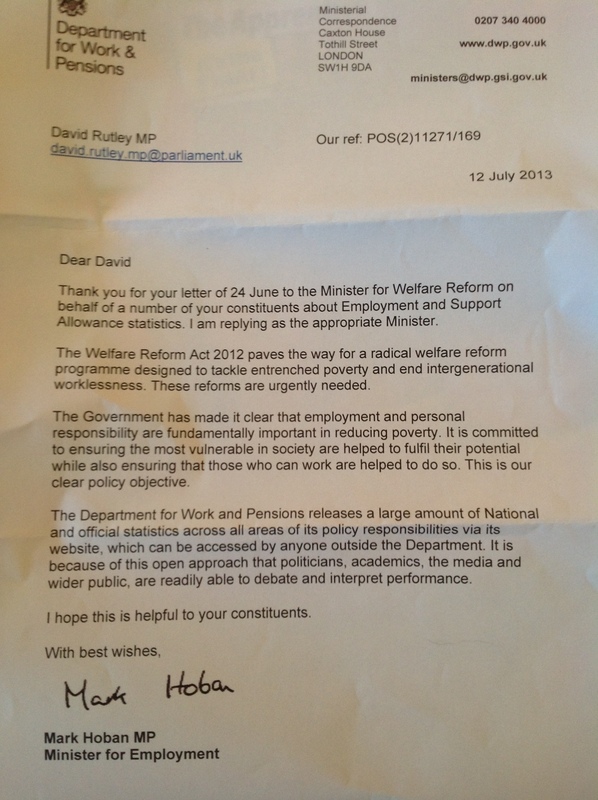 In a move which is entirely typical of Freud’s dismissive, contemptuous attitude to people needing benefits, Freud clearly backheeled the question, because Rutley received a reply from Mark Hoban, the Minister for Employment, who claimed to be the ‘appropriate Minister’. (and how right he was). But it’s worth examining it, as it perfectly displays what can only be either the most cynical dissembling or a complete detachment from reality, neither of which is a desirable characteristic in someone holding the welfare (almost literally) of millions of people in his hands. Sadly, it’s entirely typical of this government – read on and draw your own conclusions about which it is. The Welfare Reform Act 2012 paves the way for a radical reform programme designed to tackle entrenched poverty and end intergenerational worklessness. This ‘tackle entrenched poverty’ claim is just staggering. Clearly, these privileged people think that the way to end poverty is to push more people into it. The government has already admitted that its changes to welfare have pushed 200,000 more children below the poverty line – and the real figure is more like 1.2 million. Just the switch from Disability Living Allowance (DLA) to the Personal Independence Payment (PIP) will push hundreds of thousands of disabled people below the poverty line – and at the same time will deprive around 400,000 of access to their motability vehicles, which are a vital lifeline (not to mention a huge impact on the economy). The bedroom tax puts hundreds of thousands of low-wage people in a vice, penalised for having a spare room but with nowhere to move to – and again, disabled people are disproportionately affected. If I tried to cover every way in which the government’s changes are impoverishing people, you’d never make it to the end of this article. The government knows about all these impacts, and has occasionally admitted some of them – yet Hoban still blandly writes that the changes are ‘designed’ to ‘tackle entrenched poverty’. The government has made it clear that employment and personal responsibility are fundamentally important in reducing poverty. No wonder Iain (Duncan) Smith considers that ‘believing’ that his department’s changes are doing good trumps any need for evidence – or for that matter, trumps clear evidence to the contrary. The DWP’s, and the government’s, commitment to these ‘beliefs’ is evangelistic in its fervour – but it’s the fervour of the cynical television evangelist, calling people to touch the TV screen in faith while knowing full well that the only benefit is to his bank account. It is committed to ensuring that the most vulnerable in society are helped to fulfil their potential while ensuring that those who can work are helped to do so. Ah. Now it becomes clearer. In Hoban-speak – or government-speak in general – ‘help’ has a different meaning, or several. It can mean ‘forced even when it’s clearly unrealistic’; it might mean ‘thrown into the deep end and left to sink or swim’. It is because of this open approach..
Hmmmm, right. 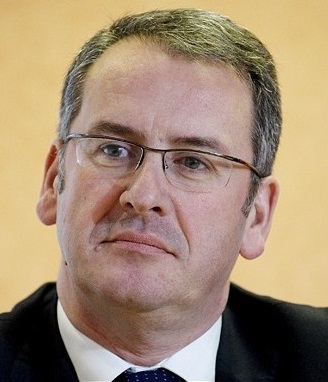 Would this be the ‘open approach’ that has led to the DWP postponing indefinitely the release of information on the numbers of people whose benefit was sanctioned, because an already exponential growth curve would be seen to have entered the stratosphere? It’s Hoban’s own department, so he cannot possibly be unaware of this kind of information-concealment for political purposes – yet he’s ‘perfectly relaxed’ boasting about its openness. It’s hard to imagine how anyone might sincerely think that depriving a disabled person, for example, of the financial help (of the genuine kind) that they need to access care, support, transport etc ‘helps’ them to ‘fulfil their potential’. But if you use the ‘Tory lexicon of misleading words’ definition of ‘help’, it suddenly all makes sense. In fact, if you work on the general principle that ‘helping fulfil’, ‘ending poverty’ etc all pretty much mean, “It’s your own fault, just get on with it”, while ‘openness’ means “hiding stuff if we want to”, then this letter and many government pronouncements hang together very nicely with their actions. Or they’re all a bunch of cynical, venal, greedy, malevolent villains that should be in prison rather than in office. “This ‘tackle entrenched poverty’ claim is just staggering. Clearly, these privileged people think that the way to end poverty is to push more people into it.” Could it be they are trying to make poverty the norm so that in the end no one will be in poverty because we are all in it together. hmmm if we look back at history it shows that this country has kept the people in line by keeping them poor, so as at the start of this decade the people of this country were better off than at any time of our history does it not make sense that this government would want to get us back to a level where we cannot cause trouble, but as history has shown this policy is a very precarious balancing act, get it wrong and as history has shown all of a sudden the revolting peasants become peasants revolting !!!! I understand that there are almost 100,000 sanctions waiting to be applied via Work Programme submissions. Claimants have received their sanction notices, but due to the back log the sanction will not kick in for a further 12 months! Thanks for that info! Do you have a source link? Hoban’s letter is the same as his response in parliament in the Cumulative Impact debate a couple of weeks ago. He’s singing from the government hymn sheet. There is no room for debate. Which effectively means ‘we don’t care what the impact is, this is all we’re saying’. Every single government spokesperson who is interviewed about policy, whatever it is, does this. Its called stonewalling. Its impossible to talk to a government who won’t listen or enter into genuine debate. The only answer is to vote them out. Is there really any point in trying to engage with a government who are determined not to listen? Did you get the email that I sent you? I received this exact same letter. Could you resend it, please? George Orwell had a word for the language in that letter – its Newspeak the language of the ‘Ministry of ‘Truth’, which was dedicated to lies. 1984 has arrived – 29 years late! “Entrenched Poverty” – is there an opposite for that state? If there is, might it apply to High Court Judges who enjoy(?) paying only 2% towards their pension (Cameron reply; PM Questions circa 2012). When last I looked Police contributions were about 11% whilst according to a Doctor’s spokesman on BBC’s ‘Today’ on the occasion of their one day strike (within the past 18 months), theirs is in the region of 30%. I’m open to correction.